Getting the job done perfectly in the typically tough conditions of hilly and mountain areas: this is the goal of the Krypton³ SIX, which takes even the most challenging terrain in its stride to answer the needs of specialised applications. With a modern design with rounded forms conceived for maximum visibility and to protect the crop, Krypton³ SIX is the most powerful model in the Krypton³ range which, with a wheelbase of 1,850 mm and an innovative 6 carriage with 6 bottom rollers, ensures impeccable stability and superlative traction. 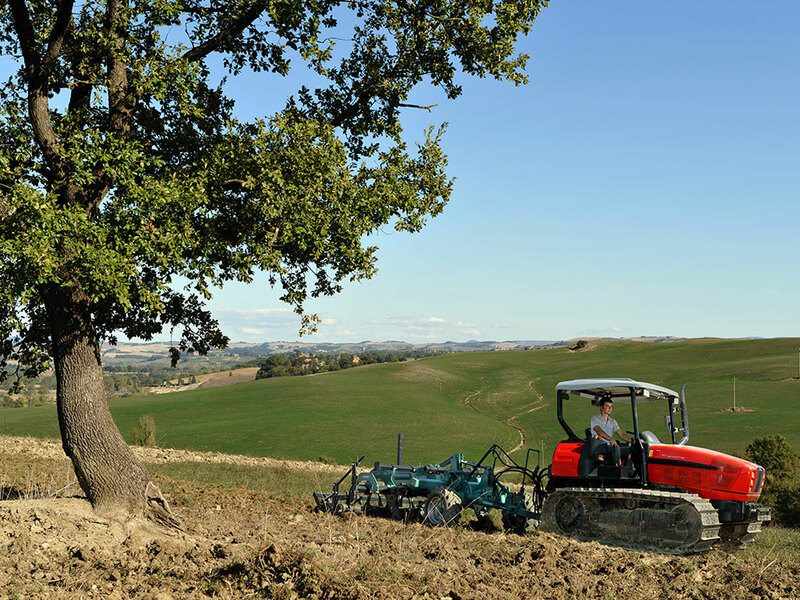 Low fuel consumption, reduced power absorption and specific measures to reduce noise offer even more reasons why the Krypton³ SIX is the ideal choice for all farmers who face the challenges of nature day after day. With technology on its side, it's afraid of nothing. Powered by new liquid-cooled 3 or 4 cylinder SDF Euro III engines with turbo and intercooler and high pressure fuel injection with electronic governor system: the Krypton³ SIX delivers the performance needed to tackle the heaviest duty jobs, but without sacrificing responsiveness and reliability. But that's not all. The electronic governor monitors the operating parameters of the engine to optimise injection times, while the viscostatic cooling fan, which engages proportionally in relation to need, is another feature of the Krypton³ SIX specifically intended to optimise engine efficiency. The results? Lower fuel consumption and an impressive 4 HP reduction in power absorption. What's better than knowing you can depend on precision, manoeuvrability and safety? A tractor created to offer the perfect solution for specialised applications must also be equipped with a transmission designed specifically for this purpose. The capabilities of the standard mechanical transmission of the Krypton³ SIX may be extended by adding an underdrive gear and supercreeper gear, for a total of up to 16+16 speeds; while the synchronised hydraulic reverse shuttle makes extremely smooth and quick direction inversion possible. But that's not all. Safety is essential when working in difficult conditions, so the Krypton³ SIX is equipped with steering clutches and brakes operated independently for each track either from the pedals or using the levers on the instrument panel, for maximum simplicity and manoeuvring precision. The reliability of a large, powerful tractor matched with the versatility of a smaller tractor. The efficiency of a specialised tractor also depends on its hydraulic system. This is why the Krypton³ SIX is equipped with two separate circuits and a tandem pump. The main circuit feeds the lift and the auxiliary distributors, while the second circuit feeds the brakes, the steering clutches and the PTO, as well as lubricating the transmission, which is essential when working on steep gradients. But that's not all. Krypton³ SIX tractors offer from 3 to 5 dual action distributors, and feature hydraulic connectors with quick release fittings that can even be used with pressurised lines, to make changing implements as easy as possible. The two-speed PTO, with wet discs, is just as versatile, and is driven by a hydraulically operated clutch, with a specific button for progressive starts. When the job gets tough, safety matters. The Krypton³ SIX is equipped with lubricated track chains. As well as reducing wear, this solution also considerably reduced noise, to offer the same levels of comfort as a conventional wheeled tractor. The Krypton³ SIX offers a comfortable work environment which contributes to reducing stress and fatigue, for increased productivity. But that's not all. The challenging working conditions which the technical capabilities of the Krypton³ SIX measure up to admirably also demand superior safety and stability. This is why the platform offers a driver's seat protected by a fixed four pillar ROPS frame, and the track chains are specifically designed to eliminate the risk of derailing. Fuel tank capacity 130 L.